When addressing the question “How healthy is the present and the future in Europe”, I take the approach which deals with both the macro-scale socio-demographic change, following the logic of the world-system analysis (for example, Wallerstein 1974), and the individual-level analysis of life-course events looking at trends and capacities of individuals and ways people take decisions related to transitions. Combining the two levels of analysis is particularly relevant in the context of the current economic crisis and austerity policy, runaway globalisation, and global demographic and ecological challenges. 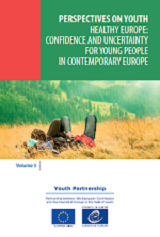 Youth transitions are essentially to do with crucial changes in the human life course – the transition from one level of education to another, the transition from education to work, the transition from parental care (and home) to independent life or own family life – all the phases increasingly associated with mobility across borders. Youth transitions occur not only against the background of individual biosocial growth and developmental processes, but are also strongly conditioned by societal processes determined by demographic, cultural, and socio-economic dynamics. Hence, before looking at individual-level life-course events, I want to mention some societal developments, mainly in the domain of demographics, that help to understand some of the challenges and opportunities with which young people are likely to be confronted.